Toluene storage buildings by US Chemical Storage. What is Toluene? The chemical toluene, formerly known as toluol, is used in many industrial and consumer applications ranging from printing operations, manufacturing facilities, and nail salons. Toluene is commonly found in metal cleaners, adhesives, varnishes, paints and paint thinners. Toluene is a clear, colorless liquid and carries a smell similar to that of paint thinner. It dissolves other substances easily and can evaporate quickly. Exposure to toluene can affect color vision, hearing, and high concentrations of exposure can lead to tiredness, difficulty sleeping, numbness in limbs, and damage to reproductive systems. Safety practices outlined below are solely used as safety guidelines when handling or storing toluene. In order to gain full compliance and safety measures, contact your local authorities or regional safety representative for a comprehensive approach for safety equipment and handling procedures. Use PPE, including gloves, safety goggles, face shield, coveralls and boots depending on the type of handling task. Practice good housekeeping when storing, loading and transferring inventory. Dispose of toluene-soaked material in approved waste cans. Wash hands after handling toluene and similar substances. Ground and bond containers while dispensing and filling materials. Keep containers closed when not in use. Properly seal drums before and after use. Monitor data of employee exposure. Handling and transporting empty drums requires care equal to or greater than drums with full chemical contents. Toluene drums that are empty can be more dangerous than a full drum if contents are not completely removed. Toluene should be stored in approved chemical storage buildings designed for such use. Two or four hour fire-rated buildings are used to store chemicals inside facilities (depending on specific regulations) or nearby occupied facilities at distances greater than 10 feet. 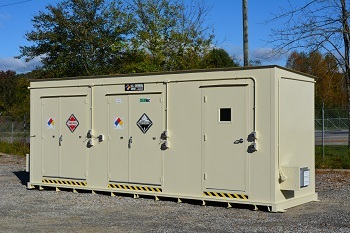 Non-combustible chemical storage buildings are used for storing chemical contents outside of occupied facilities at distances greater than 30 feet. Chemical storage buildings must be free from ignition sources and hazmat placards and other signage must be easily readable. Engineering controls, including exhaust ventilation (snorkel, fume hood, mechanical ventilation etc.) must be in place when storing toluene to rid harmful vapors from the work area. For more information regarding toluene storage buildings contact US Chemical Storage online or call 1-800-233-1480.